Rustic log cabin furniture or rustic Americana was originally intended to be an inexpensive and practical solution for rustic retreats. Popular around the turn of the 20th century, primitive log cabin furniture was used in resorts, camps and the second home retreats or rustic lodges of the wealthy. However, in recent years, log cabin furniture has been recognized for its artistic and collectible value. It is now recognized as a craft and a form of primitive art. A log house is not a home—until you make it one! How do you do that? Well, you put yourself and your personality into the furnishings and decorations in your home. Your home should reflect what you love, and what you love to do. Log cabin furniture, casual by design, will help you do that. Guests who visit you, should instinctively feel that your home “is you”. 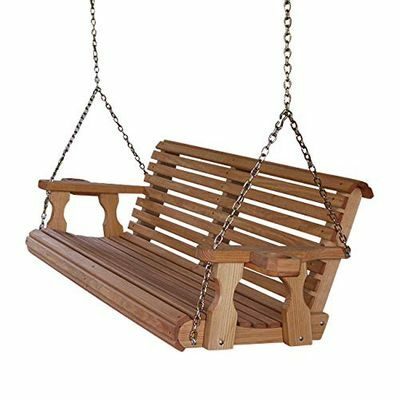 Amish Log Furniture – The Amish have a reputation for building quality, handcrafted furniture, like their infamous bent wood rocking chairs. Even today, Amish furniture is handmade in small Amish barns and with strict standards for construction. The Amish take pride in their work, and they deliver quality log cabin furniture. Rustic Bedroom Furniture – While log furniture is very popular in log and timber homes, there are other styles that give your home rustic appeal, as well. Reclaimed barn wood furniture, furniture with rustic carvings or metal silhouettes, and furniture with twigs or antlers are all very fashionable in rustic homes. Rustic log cabin furniture is popular today because many see the intrinsic beauty of its craft. Designs weave natural materials like logs, branches, twigs and sometimes antlers or horns into furnishings. And each piece is a unique design, like no other! 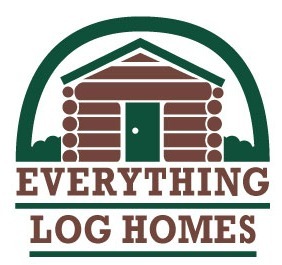 Your choice of furnishings will make or break the look of your beautiful log home. 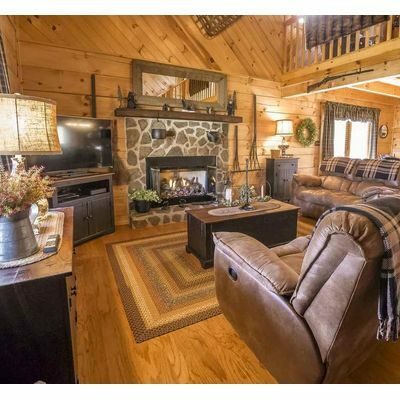 Does everyone fall in love with rustic log cabin furniture? Absolutely not. It seems that people either like it or they don’t. Those who appreciate the qualities of rustic furniture also appreciate the beauty of nature, and often seek to bring the natural world around them—into their homes. You may be interested in reading about Rustic Cabin Decor. Although log bedroom furniture is used most often in log cabins and log homes, it can also enhance the interiors of timber framed homes or post and beam homes. Log furniture for the bedroom is no longer like the handcrafted log furniture that your great-grandfather may have made—crude, simple and straight from the woods to the bedroom. Today you’ll find beautiful bedroom pine log furniture, cedar log furniture and aspen log furniture—simply designed, or with lovely carvings and beautiful inlays. And, you’ll also find matching (or contrasting) dressers and end tables with decorations that go with your theme! This log bed has beautiful chain saw bear carvings in its design. Truly unique, it is a conversation starter. If you’ve decided to use log furniture in your bedroom, you need to choose your bed first, as everything in the room will be secondary to your log bed. 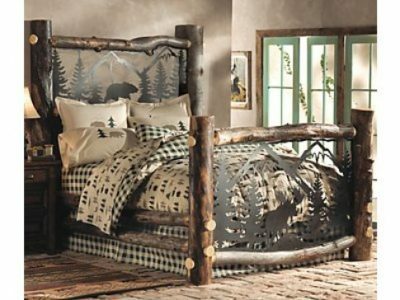 Log bed furniture with carvings – You’ll find interesting carvings of bears, trees, deer, and pine cones. Often you can choose a matching dresser or end table to go with your bed. Headboard with metal scene – You can bring a lovely outdoor scene into your bedroom with this type log bed. This log bed is an example of a log bed with a metal scene on its headboard and at its foot. Carved slate headboard – with a rustic outdoor scene. Antlers – integrated into the design. Wrought iron railings – An interesting combination that might appeal to you. 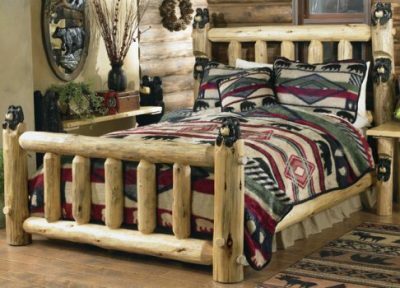 Traditional log bed – Very similar to antique log beds that you may have seen. First choose a rustic theme for your master suite, your guest room and children’s rooms. Next choose your log bed, which will be the center of attention in your room. For the kids’ rooms or your bunk room, there are cool log bunkbeds that are more fun than anything we slept in, as kids. Finally, choose log accessories like rustic tables, chests, benches and dressers to complete your rustic bedroom decor. To help round out your country bedroom retreat, you’ll also want to select cabin rugs and country comforters that help pull your room together. Blanket or cedar chests give you a sensible way to store out of season bedding, and rustic benches or decorative chairs afford a place to sit while donning your socks and shoes. You can dress your room up or down—depending on whether you are decorating an elegant rustic lodge or a small rustic weekend or hunting cabin. And of course, everything in between! When you choose cabin bedroom furniture, you’ll be amazed at your choices in rustic log beds, night stands, dressers, and armoires. This beautiful blanket chest is made of recovered barnwood, with logs at the corners. Choose log bedroom furniture accessories to complement your log bed and other furniture. Rustic log furniture is not limited to a single wood. 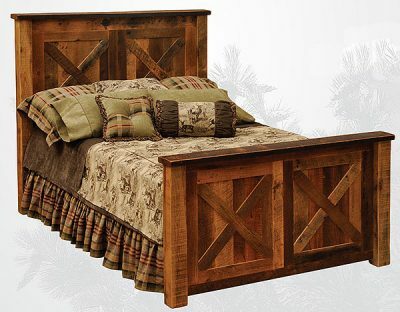 You will find log bedroom sets in pine, cedar, hickory, aspen and even re-purposed barn wood. Since your bedroom is truly your most private space, and it is indeed your retreat, why not spend a little time to outfit your master suite with special rustic furnishings? Choose log bedroom furniture accessories to complement your log bed and other furniture. This beautiful blanket chest is made of recovered barnwood, with logs at the corners. Log bedroom furniture does have logs built into it, often on the corners. When choosing accessories for your bedroom, look for straight logs and strong joinery. However, if the logs are decorative (as in a rustic bed), they can have interesting twists and shapes, to add rustic appeal. Rustic log furniture is joined with notches built into the logs, with pegs or with metal fasteners that are not visible on the outside. Log furniture is handcrafted and it is often a very high quality of workmanship. Rustic pine log furniture is by far your most economical choice of log cabin furniture. You will see two kinds of pine used in logs: lodge pole pine and knotty white pine. White pine is grown in the northern U.S., and lodge pole pine is grown in the western U.S.
White pine is a strong wood, while southern yellow pine is pithy and lacks strength. White pine is a creamy white when new, and it develops a yellow patina as it ages. You can find cabinets, furniture, knotty pine paneling, tongue and groove wood planking and small accessories made from white pine. White pine is not as sensitive to moisture content as other woods, and it does not swell or shrink a lot when humidity changes. Furniture made from white pine is not as likely to bend and warp, with temperature fluctuations and high humidity. Pine log furniture looks fantastic in a rustic bedroom. Lodgepole pine gets it name from it use in Native American tee pees or lodges. Typically a teepee had 15-18 lodgepole pines in its structure. The native Americans used these pines because they are straight, easy to transport, and relatively thin. In coastal areas of the northwestern U.S. and Canada, there are bent pines, as well. An example of a table made with lodgepole pine. I love the irregularity of the branches and the partially peeled legs of the bench. The logs from lodgepole pines often make very interesting pieces of furniture. The rich color variances in cedar–along with the delicious aroma and natural pest-repellent properties–make cedar an excellent choice if you’re looking for a log bedroom set with dramatic flair. In fact, you can even have a house built with cedar logs. They do cost a little more, but some people prefer cedar to other kinds of logs. Aspen wood is noted for its pale silvery and golden amber hues, making it an interesting choice for your log furniture. Aspen wood often serves as an interesting contrast with your log walls and wood floors. No matter what wood you choose for your log bedroom furniture, your furniture will be solid and comfortable—and it will have you “sawing logs” in style! Rustic bedroom furniture, made of reclaimed barn wood, hickory, oak or pine, can give you the casual elegance or hunting camp simplicity that you want for your cabin. Without logs. Let’s face it. Not everyone wants log furniture. Fortunately there are a number of great alternatives, keeping the rustic theme, without the bulky look of logs. Made from reclaimed red oak, this bed is from an 1800s tobacco barn. It has a traditional barn door plank design. Adirondack furniture – Adirondack furniture can use bent twigs or branches, geometric designs or even a painted scene on the bed headboard or the side of a dresser or night table. Furniture with carvings – Carvings are found in all types of rustic wood furniture. Wood carvings can help to pull your theme together in the room. Rustic iron furniture – Just as antiques work well in a rustic cabin or lodge, rustic iron furniture does also. You may find a bed headboard or an entire bed made entirely from rustic iron. Antler furniture – Yes, you can find furniture that has artistically incorporated antlers into it. Often antlers are found in the headboard or foot board of a bed, but you may also find them in other rustic furniture pieces, too. Log furniture – Log furniture is perhaps the most traditional rustic bedroom furniture. 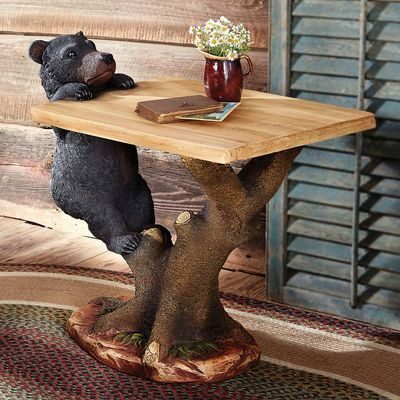 Some pieces are very simple, but log furniture can also have details like hand carved animals or pine cones, as well. 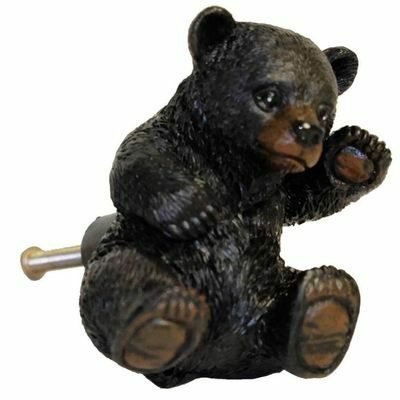 Metal art silhouette furniture – Often painted black, metal silhouettes like bears, deer, moose, trees and pine cones are often used on rustic furniture for the bedroom. You may find dressers, chests or night tables with silhouettes that match the figures on your headboard. Southwest furniture – often hand painted, this type of furniture has geometric designs that mirror American Indian designs. Amish furniture – noted for its quality, Amish furniture is usually fairly simple in design. Amish furniture can be handcrafted and have finely made joints. It comes in different woods, and you may be able to order custom made pieces. Pine bedroom furniture – Pine, of course, is an old standby. It’s a relatively common and inexpensive wood. Pine is a relatively soft wood. If your first priority is economy, you might consider looking for rustic pine furniture with simple lines. Oak bedroom furniture – A hard wood, oak can take on rustic qualities if you choose the right style. Shaker furniture is simple in design and is often made in oak. And reclaimed barnwood is often oak, so in addition to getting a pretty piece with a patina, a reclaimed oak board also offers long lasting beauty and wear. Hickory furniture – Hickory is quite informal and can be quite rustic. It has (sometimes) wild patterns and the colors vary dramatically from piece to piece. Hickory will darken with age. If you choose hickory bedroom furniture, remember that natural (no stain) wood will give you the most dramatic effect. Barnwood furniture – Remember the barn wood fad during the 1970s? It was quite fashionable for people to use barn wood to refinish their recreation rooms. Well, barn wood is still “in”—but this time in rustic wood furniture. As above, it is often oak wood that is reclaimed from barns. Alder furniture – Alder wood has a lot of knots, and it often is finished to have lovely red tones. It looks great in a Western or Southwestern decor. Cedar furniture – Cedar has white and red tones in it and you might want to consider using it as a contrast to other furniture pieces. Some rustic bedroom furniture also uses aromatic cedar drawer bottoms, which can bring the lovely scent of aromatic cedar into your home. As you can see, there isn’t just one kind of rustic bedroom furniture. You have dozens of styles and woods to choose from, and you can achieve just about any look that you’d like in your rustic log home or timber lodge. Rustic pine furniture, with its natural variations, is the perfect complement to the decorating projects in your log cabin or timber home. Pine furniture is popular, partly because of our desire to live closer to Nature and partly because it is an artistic form of folk art. It is traditional and its history goes back to the beginning of our country. Using pine furniture in your rustic home gives you lots of options. And rustic pine furniture also blends in well with your beloved antiques and favorite heirlooms. Why Decorate with Pine Furniture? 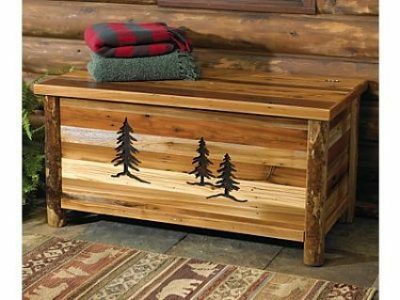 Furniture made from pine logs is sturdy and rugged. It is unmistakably rustic. And, in addition, pine furniture naturally becomes distressed, over time. Because of the wood’s soft nature, it will get little indentations and small marks, with normal use. The pine furniture items above are constructed of solid kiln-dried lodgepole pine or knotty pine wood–no fiberboard or laminates. Quality furniture, made by hand, gives your home a unique high end appearance. Yet it is a comfortable look, with a cozy down-home feeling. 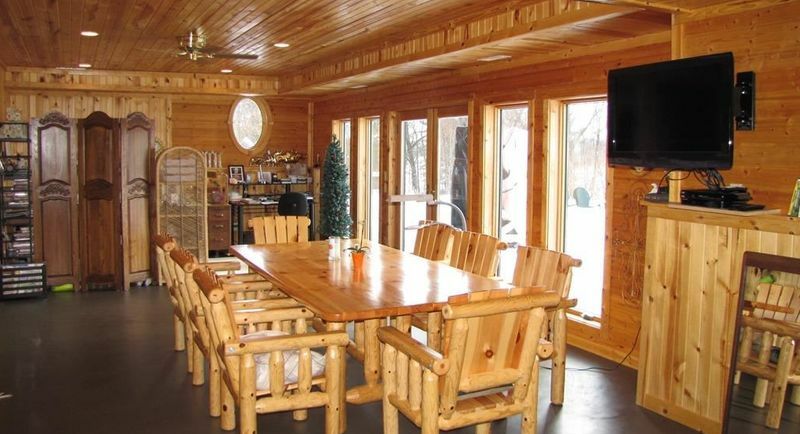 Pine log furniture is a popular type of rustic pine furniture in many log homes. 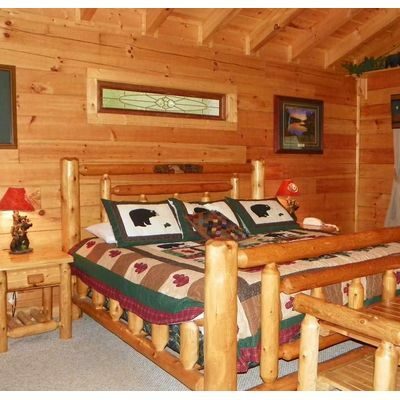 And log beds are a great way to furnish a log home bedroom. This bedroom uses round logs in the furniture, which contrast with the flat sided log walls and the tongue and groove ceiling. Note the Pretty quilt and curtains that complement the rustic pine furniture. Where Would You Use Rustic Pine Furniture? Rustic pine furniture is a great complement to most cabin themes. 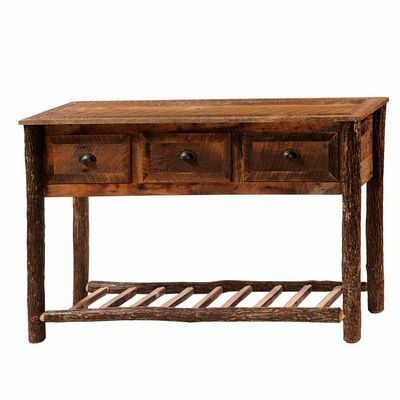 You’ll find that this versatile line of furniture often has just the piece for that place in your home that needs a little rustic appeal. In addition, rustic style furniture, with its handcrafted appearance, makes your home truly unique. Each piece will vary slightly from the others in color and finish. Rustic Pine Coffee Table – Pine coffee tables, because they are not as hard a wood as others, will take on a used, distressed and rustic look, after a few years of use. 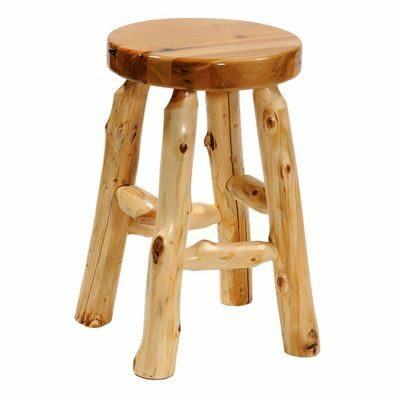 Pine End Tables – Cute little pine end tables can be used in the living room beside chairs or a sofa. Or they can be used as bed tables, beside the beds in your bedrooms. Rustic Dining Room Tables – Choose your dining room furniture to complement the other rustic furniture in your home. 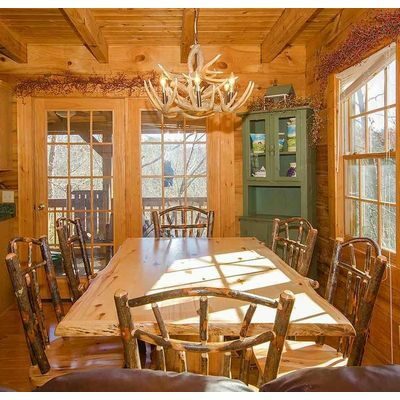 Log homes don’t need fancy dining room tables and chairs. 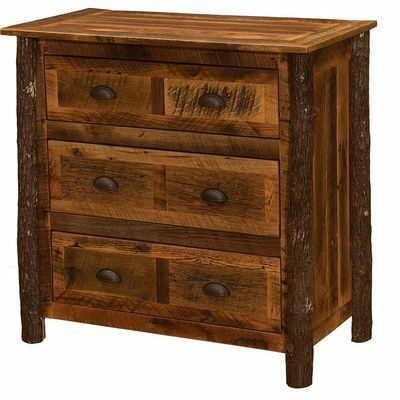 Rustic Dresser – A rustic dresser can work in any room of a log or timber home. Consider using a rustic dresser in a large bathroom for storage, in the kitchen or dining room for linens, in the great room for DVDs or for board games. And, of course, your bedrooms are a great place for a cute rustic dresser. 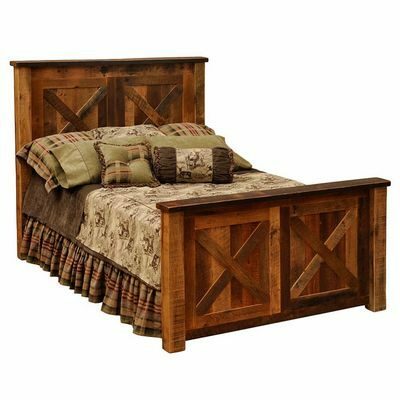 Pine Log Bedroom Furniture – Pine log bedroom furniture goes well in any log cabin, lodge, timber frame, or post and beam home. So, if you are looking for a natural, rustic and handcrafted look for the furniture in one of your home decorating projects, consider using a piece or two of rustic pine to enhance the rich style of your home. Handcrafted, using traditional woodworking techniques, Amish log furniture is made much the same way as it was, a hundred years ago. Log furniture made by the Amish, is a popular choice for rustic furniture in a log or timber home. It complements other rustic furniture nicely. Amish log furniture is simple in design. And it comes in many different woods, including cedar, pine, walnut, aspen and hickory. 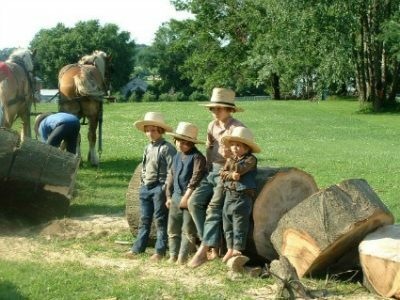 In many Amish families, the cedar log furniture of the family home has been handed down through generations, as heirlooms. And that is true for “English” families (the word the Amish use for those who are not Amish), as well. Through the years, people have come to trust Amish furniture for its quality and craftsmanship. People who live in states like Pennsylvania or Ohio, are well acquainted with this fact. Amish craftsmen have been making quality furniture for decades. They are known for their handcrafted pieces, and for the heirloom quality of their work. Log furniture is strong, durable and often massive. And there are many kinds of log furniture to choose from. Your choice of log furniture is limited only by your imagination. And by the Amish furniture that you are able to find in your area. 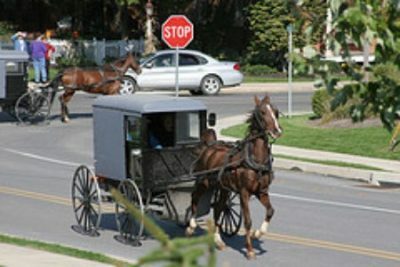 The Amish are very private people and they have very strict rules about what they can and can’t do. Your rustic log bench may have begun as a large log like this one. Amish children watch the Amish men while they work. If you’re not Amish yourself (really, how many Amish are online? ), you might have a hard time buying directly from the craftsman. Sometimes you can find Amish pine log furniture or cedar log furniture in shops in small towns in Pennsylvania, Ohio, Indiana or Michigan. These retail shops use propane for heat (Sorry, no air conditioning) and light, and they are never open on Sundays. If you are lucky enough to find an Amish furniture shop, you will find it to be very simple. No frills, no elaborate displays–just the furniture, quilts and other handmade items that are being sold. When you buy Amish log furniture for your rustic home decor, consider whether you want it to match the wood in your home–or contrast with it. Decide whether you want to buy just one accent piece or you would like to go for it–and have log furniture in all your rooms. 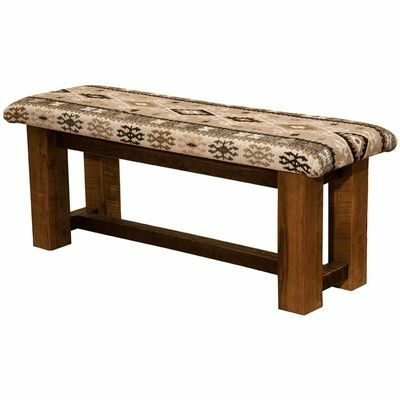 No matter what effect you’d like, you’re sure to find beautiful quality Amish log furniture to suit your needs. And you will certainly enjoy your sturdy rustic log furniture for years to come. Log dog beds are the perfect complement to the rustic furniture in your log or timber home. And many of these pet beds offer cushy comfort, as well. Log beds for dogs come in a number of different woods and styles. You can choose from lodge pole pine or cedar, and, in more contemporary designs, you can find ash or sustainable bamboo dog beds. How Will Your Dog Bed Look? Choose a dog bed that complements your rustic decor. You can mix and match kinds and colors of wood. So you can pick a dog bed that either matches or contrasts with your other furniture. 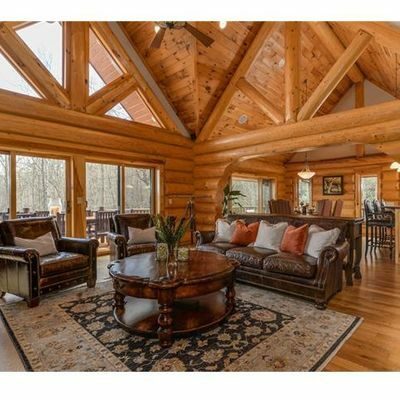 Eclectic interior decor does work in log homes. Where will you put your dog’s new bed? If it is in the great room or main living area, you might choose a furniture log bed made of wood or perhaps a sofa dog bed. Your dog’s daytime bed is simply a place for him to lounge, near the family. Dog bed designers are even designing leather sofa beds and overstuffed luxurious dogs beds that look good enough for dog owners to sleep on! If your dog’s bed is for night-time, it will probably be in your bedroom. In this case, you might choose a bed that looks like your own log bed. Consider how your dog’s bed will look in the room where you intend to put his bed. Most important, is how your dog will react to her new bed. Some dogs like to snuggle down into a cave-like structure, like the coffee table dog bed above. While others are just fine with an open bed and nothing overhead. What does your dog like to do? When buying a log bed frame, include a mattress for your dog. A log bed or wooden bed can get pretty hard without a soft mattress. You can buy a luxurious overstuffed dog bed, or you can add your own mattress to a log bed. If your dog is older, a nice orthopedic mattress, a heated mattress or a memory foam mattress may help support those arthritic bones and joints. A good log dog bed will lend support to the mattress, as well. A well-chosen bed will add to your rustic country decor, and it will keep your dog comfortable and happy.